Because I am planning for all four levels, I have to start somewhere and the reasons I start with high school are 1) I think high school needs to be challenging and 2) I don’t have a full high school library yet, but I have lots of options for middle school and down the line. If you haven’t read my post on how I select and shop for my book choices for an entire year, you might want to read that first. So… high school. Daunting? Yes. I’m here to tell you, though, that homeschooling high school can be done and done well by a homeschooling mom of average intelligence and even by one who probably couldn’t do high school algebra again without crying. Seriously. That’s not today’s topic, but it does influence any aspect of homeschooling high school. Anyhoo…. 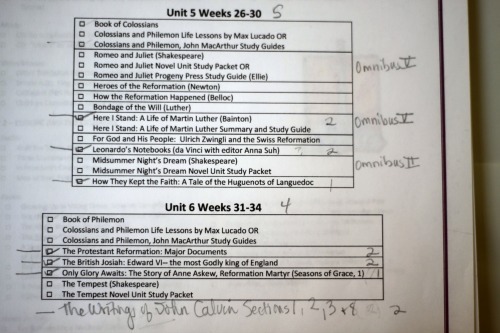 How do I decide what to assign for literature and history reading in high school, especially while using BiblioPlan? I open the lovely Family Guide to the High School Book List page and start making decisions. Want me to tell you all about it? Ok. It all starts here with the book list, really. I’m really glad BiblioPlan thought to put all of the high school books together because I’m pretty visual. 1st: I check off the Resources and the Optional Texts I want to use first. That is pretty easy. It’s important to remember that we don’t want our high schooler to be overwhelmed. We want them to learn and a fire hydrant of information and reading isn’t ideal for learning. A water fountain is better. As much as I like check marks, I don’t check mark all of the options. I use pencil, which is an important note for later. 2nd: I read the entire book list to get a feel for the year. This drive by reading of the book list helps me see what we are facing and what the year would look like for my high schooler. As silly as it sounds, I think it’s an important step because if we only look at each “section” or division, then we can miss the boat of effectiveness. 3rd: I start making my initial decisions. 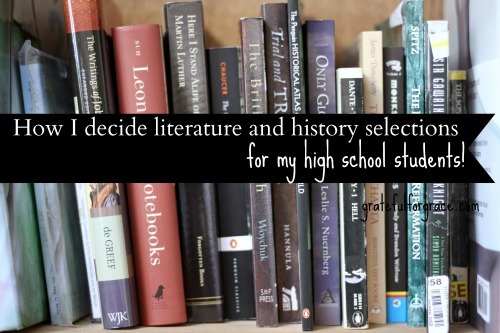 This involves me choosing the ones I most want my teen to read based on the books I’m familiar with myself. I check mark each one I like. There will be too many pencil check marks at this point, but it’s my initial decisions, not my final ones. 4th: I look up books unknown to me for two pieces of information. Some of the books on the list are always new to me and I need to read about them. A) What is this book? I use the BiblioPlan blurbs about the books AND I use Amazon reviews and summaries so I can learn what this book is about and what makes is special. I like hearing what other people say about a book, especially if a teen chimes in by writing a review. Books that sound good get a check mark. B) How long is this book? An important part of not overwhelming our high schoolers is knowing how long a book will take to read. 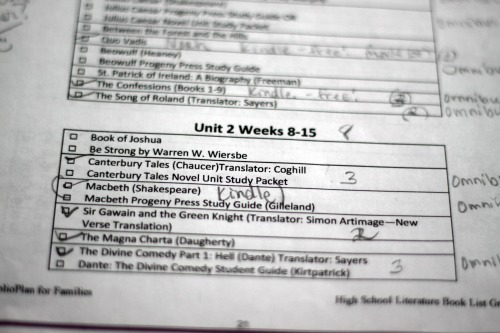 Most of the selections in the high school list will take more than a week to read and each section is about seven weeks long (varies), so if we choose five options in a section, we are setting our kids up for failure. I mark how many weeks I think it would take my high schooler to read the books I’m interested in based on the blurb and reviews. 5th: I decide the final choices and include my teen. A) I like to make sure my kids get at least one of each kind of genre in their “section” (fiction and non-fiction). Which way you lean each section, you’ll have more than two books, most likely, and you’ll have to decide if the non-fiction is more or the fiction. My kids would be miserable if they had to read mostly original documents and non-fiction, but they don’t get out of reading those types of books. So, I make sure their is a smattering of each. This factor is another reason it’s important to read all of the books for the year before deciding. You could end up with Shakespeare only for the year. 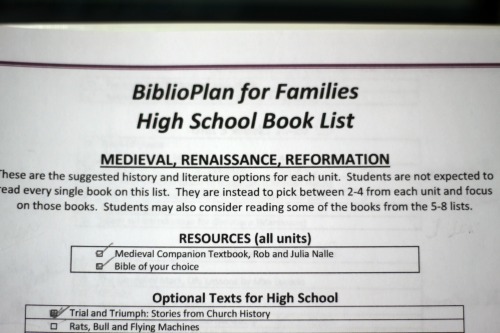 While a Shakespeare unit isn’t horrible, BiblioPlan isn’t a unit on one author. No matter how much we love Shakespeare, we need to make sure we are giving our kids a variety of genres and authors. I mix it up for them. B) I also like to hear my student’s input. So, we sit down together and look at the check marked books. When homeschooling more than one high schooler, this could mean different book choices for each. I’m cool with that, to a point. I can’t afford to build a double library, so we would have to talk this out nicely. I love hearing what my kids are interested in reading. It’s often surprising and usually fun. So, I am sure to include their requests. Sometimes this step helps me when I can’t decide between two (or more) books. C) We compromise or I pull the “I’m the teacher” card. They don’t get veto power because then my kids would never read original documents, but I do want them to feel invested in their education. In this step, we have to be willing to be a bit flexible. 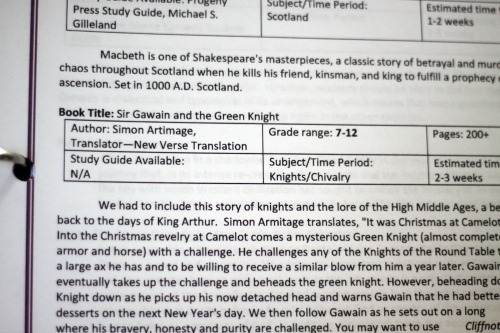 For example, Noah really wanted to read MacBeth, but I couldn’t fit it in with his and mine other choice for that section, so we moved it to different section that was lighter in firm choices for us. That way, he gets to read it, but he still covers books I want covered. Win/win. D) I see which books are discussed in Omnibus. I like adding Omnibus to our high schooler’s plans, but only small aspects of it. They read the general information, significance, main characters & setting, and the worldview sections. They don’t write it anything up. I just like the exposure. If a book is in Omnibus and I am wavering between it and another book, I’ll usually go with the one in Omnibus. E) I think of any books I want them to read that aren’t covered. This doesn’t happen as often in high school, but it can still happen. For example, I wanted Noah to read a bit about Calvin next year, so I added four chapters from a book about John Calvin. 6th: I make the final check marks. This is the last decision making step. It can be difficult for me. I love books and it’s not easy for me to turn any away. I’ve learned my lesson, though, and I work at doing this. I erase any books that aren’t getting read this time around and leave all my final check marks. 7th: I order the books. I have found Amazon to be my best option for book shopping for our homeschool. The prices are usually the best, especially checking out the used sellers and the fact that we have Amazon Prime. Half Price Books is super, if you live in a state with them. Also, don’t forget used options on forums and such. Still… we bought all our books on Amazon this time. 8th: I write in the selections I’ve decided in both the Family Guide lesson plan pages and my high schooler’s lesson plans. I shared in this post how I make individual lesson plan binders for each kiddo. The last step is that I write or check mark my decisions in both places. This involves me deciding how many weeks each selection will be assigned. I write in pencil, in case a book takes longer or shorter to read than I thought. So, if Dante’s Inferno is assigned for three weeks, the first week it says Dante’s Inferno (1/3), the next week I write Dante’s Inferno (2/3), and the final week my student reads Dante’s Inferno (finish).